Hurmazd I (AD 270 - 271) and Bahram I (AD 271 - 274). On Shapur's death (AD 272), his son Hurmazd took over the throne, but held it for only a very short time. He enjoyed his good fortune for a year and ten days, without doing anything that has ever been recorded. The next king, Varanes (Bahram I) who reigned for three years, was the same. It was Bahram I (Bahram also spelled Wahram) who failed to take advantage of Roman disarray after the capture of Valerian, and make an alliance with the up-and-coming power of Palmyra (see here). He let both Mani and Kerdir have a free hand competing for the religious allegiance of the Persian nobility. Bahram II, his son, encouraged by the Mowbed Kerdir, turned against Mani, who was put to death in AD 276. His support for Kerdir made him very unpopular. Some of the Magi were already showing a taste for the political power they'd come to exercise in future centuries. Opposition came from the nobles led from inside the royal family: the Saka (who we've not heard of for some while - still in Seistan) and the Kushans (reluctant allies of the Sasanians) started a rebel movement in the east, lead by Bahram II's brother Hurmazd. A new batch of Roman emperors was ready to try their luck against the Persians. Probus (emperor 276 - 282) died before he even got there. Carus (282 - 283) laid siege to Ctesiphon but died there, apparently struck by lightning. Diocletian (284 - 305), the next emperor, bought some time with a truce, while he strengthened the Roman frontier. Then he decided to intervene in Armenia, which was restless after 50 years of direct Sasanian rule. 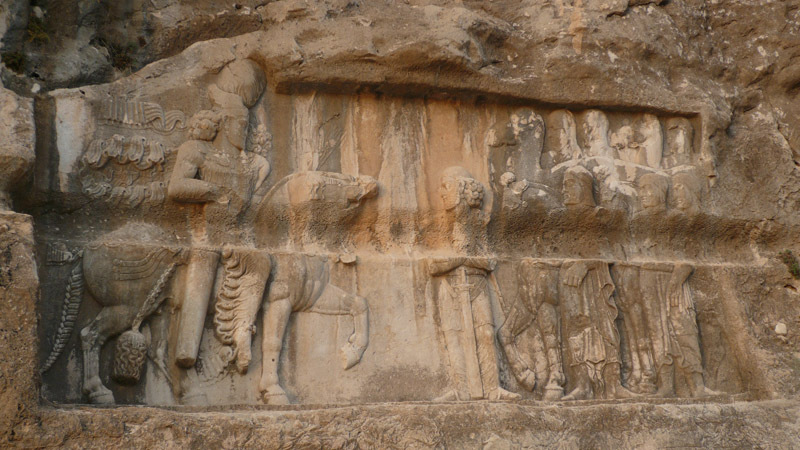 His army invaded Armenia to support the Roman-educated Arsacid Tirdad's claim to the throne, against Shapur's son Narseh, who was"Great King" of Armenia. Bahram II could do nothing as he had to deal with his rebel brother Hurmazd. He defeated him, and made his son Bahram III king of the Saka, only to find his uncle Narseh was now leading an anti-Kerdir rebellion. Narseh was the eldest of Shapur I's sons - and might have felt aggrieved at having been passed over three times. When Bahram II died, there was a move to make Bahram III king - this was too much for Narseh. He eliminated his great-nephew and supporters, and - at last - became king of kings. After Bahram III's very brief rule, Narseh (aka Narses) restored a little calm. The influence of Kerdir and the Magi was curbed a bit, and, with no frontier problems elsewhere, he turned his full attention to Armenia. In AD 295 he marched into Armenia in strength, kicked out the Roman puppet Tirdad, and swept down into Syria. Diocletian responded - but the Roman army for a third time handed a home victory to the Persians - not far from where Crassus lost at Carrhae in 53 BC and Valerian at Edessa in AD 260. Details of this battle are unknown, and likewise of the Roman counter-attack: Narseh however was severely defeated in Armenia in AD 296. Narseh's family and many nobles were captured, and Narseh had to agree to peace on Roman terms (Peace of Nisibis AD 299). 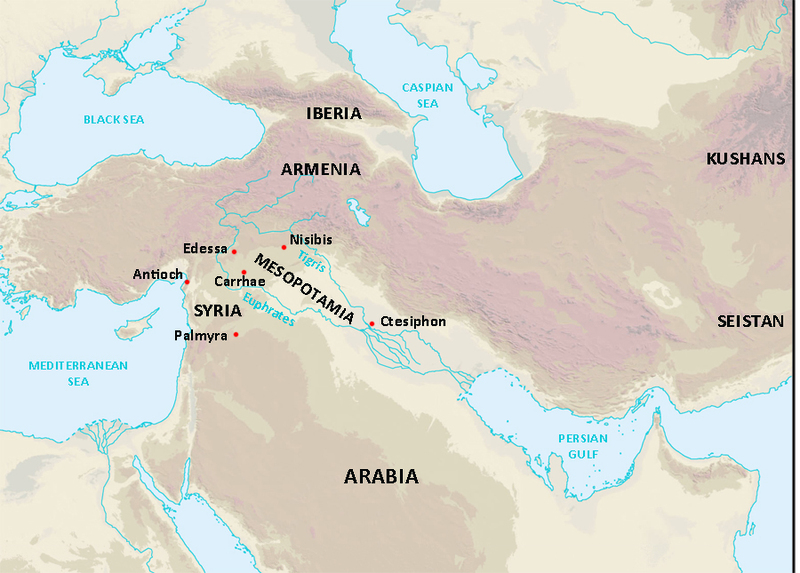 These terms were humiliating for Persia: the frontier was moved east from the Euphrates to the Tigris (all Mesopotamia went to Rome, therefore). And all trade now had to pass through Roman Nisibis. Tirdad the Parthian was reinstated in Armenia, which was recognised as Roman territory - important because it was soon (perhaps in AD 301) to become the world's first Christian country. Not that all Armenians became Christians - Ahura Mazda and Anahita continued to be worshipped. Iberia (Georgia) to the north of Armenia (Christian from AD 337) was also designated as Roman. But Narseh did get his wives back. Narseh, shamed, abdicated in AD 301 and died soon after, leaving the problems for his son Hurmazd II. The Romans remained unchallenged in the west, while trouble in the east was defused by his marrying a Kushan princess. We don't know how he died - out hunting, or maybe fighting Arab raiders in the south, but he was still a young man. He left behind three sons - and a pregnant wife. 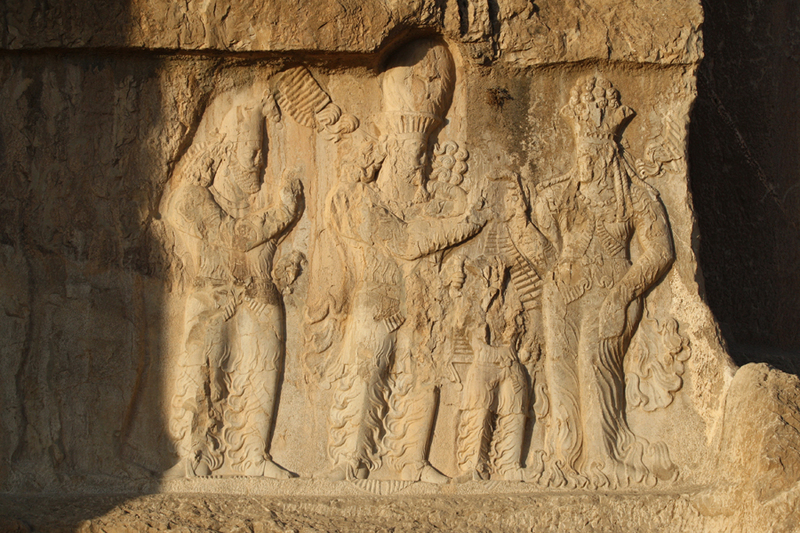 Shapur I's sons and grandsons have their brief moments of glory. Only Narseh, the least favoured son, is temporarily successful. Armenia (inevitably) becomes a football between the super-powers once again. To cope with the swift turnover of Roman emperors, this timeline may help. See here. You'll need to scroll down a bit. Kushan relief from 2nd century AD from India - showing a woman with a young child. Probably not actually the infant Shapur. Like Shapur I and Kerdir, Narseh left a bilingual account of his deeds in an inscription on a building very similar to the "Zoroaster Cube" at Paikuli (now in Iraqi Kurdistan).